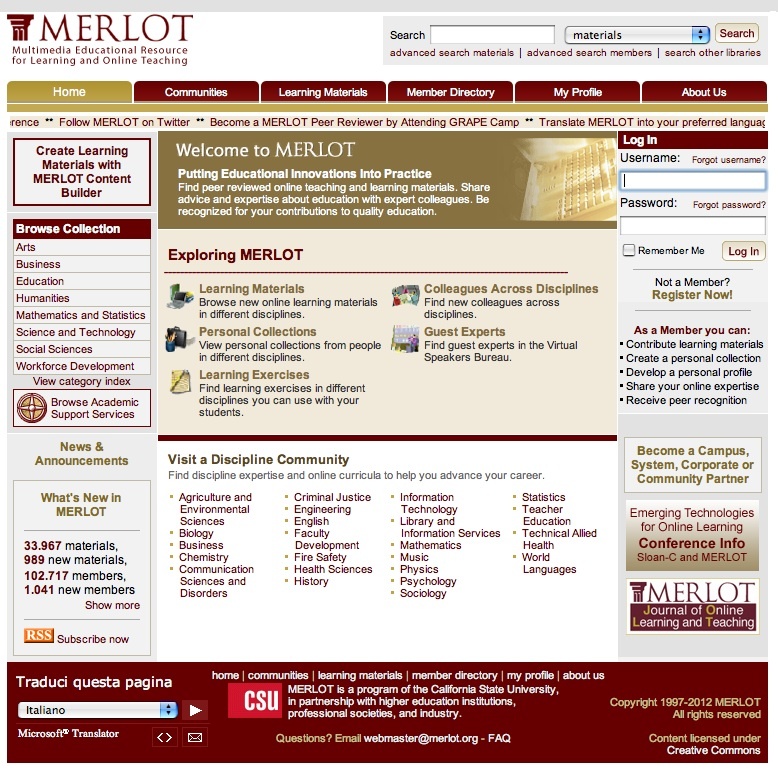 MERLOT – Multimedia Education Resource for Learning and Online Teaching – is a non-profit organization dedicated to creating a central clearinghouse for college level peer-reviewed online learning modules. With a continuously growing collection of online learning materials, peer reviews and assignments, MERLOT helps faculty members to enhance instruction and conduct transparent evaluation of online teaching-learning materials. MERLOT is a community-based organization subdivided into disciplines. Non-members can locate teaching and learning materials within their discipline as well as colleagues who share the same interests. Members can also review or submit new learning objects. These learning materials are located and are retrievable somewhere on the internet: they can be websites, webpages or documents containing a lecture, a paper on a specific topic. MERLOT staff stores a description of them, then the ranking process for evaluating teaching-learning materials follows the model of academic peer reviewing. Each review is conducted by at least two higher education faculty members on the basis of three standard criteria: Quality of Content, Potential Effectiveness as a Teaching Tool, and Ease of Use. For each classified content an overall and category rating and description is available. Editor’s choices are also indicated.